To put it in technical economic terms, Ireland is in a bit of a hole at the moment and the Irish FA (FAI) are far from immune – being, as they are, in the red to the tune of somewhere around €50 million. 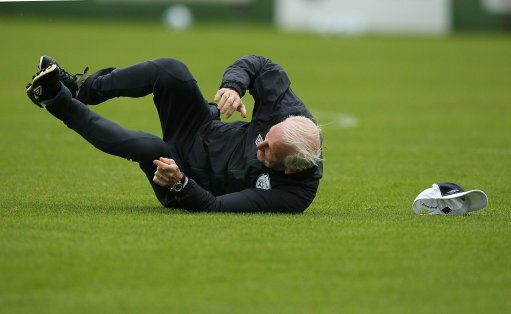 In a bid to ease the FAI’s monetary woes, Ireland coach Giovanni Trapattoni has agreed to take a recession busting pay-cut of ‘in excess of 5%’, which is due to come into effect immediately. Trap’s reduction alone is though to be saving the FAI around €100,000 a year and, as the Italian’s backroom staff have also agreed, the Beeb reckon that roughly €160,000 will be saved in total – with a third of that amount going toward reimbursing businessman Denis O’Brien, who currently shells out for more than half of the management team’s collective salaries. Well, that’s Trap and co. sorted. Now for that pesky crippled property market, those tricky record unemployment levels and this darned €85 billion international bailout. Eh, Northern Ireland coach Giovani Trappatoni? Hoi now! Oh goddamn it. I’m blaming the bloody snow seeing as though everyone else is! 86 Billion euros, not million. Hell’s teeth! And there’s me thinking I’ve come up with a semi-intelligent political retort. Utter, utter fail. Anymore glaring errors while we’re at it?